Click here for The Leaders’s article online! Residents said it was a decision that would be the lasting legacy of Kogarah Council. 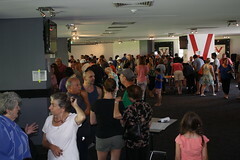 And despite resident opposition the council adopted the new city plan with some amendments at an extraordinary council meeting on Monday night.Hundreds of people turned out to voice their opposition to the plan with standing room only as concerned residents crammed into the Venus Reception Centre. 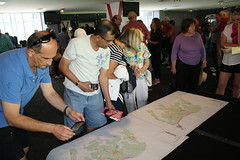 Dozens of people spoke during the public forum with the overwhelming majority opposed to the plan. Residents spoke of how their lives would change under the plan and how the village feel they enjoy now would change to a concrete jungle. ‘’No-one I have come across has supported the plan,’’ he said. 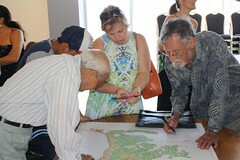 ‘’Residents feel that their voice isn’t being heard. 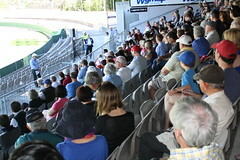 United Kogarah City Residents Association spokesman Tony Soubris said that the meeting was a farce. ‘’This is not what we want. What we want is a public hearing,’’ he said. Only one person spoke in support of the plan during the public forum. He said that the plan would stimulate business in the CBD and along the Princes Highway corridor. He also said it would help create more employment opportunities and encourage cheaper housing. Kogarah Council released a final report on the plan late last month with only minor changes made to the initial report. Despite many thinking the plan was already a done deal councillors passed some amendments. The council report proposed a height of 21 metres for properties along King Georges Road and the Princes Highway at Blakehurst. However a council amendment reduced it to 18 metres. Other Blakehurst streets that had a proposed 15 metre height limit were reduced to 12 metres. The report had proposed a 21 metre height limit for properties on the Blakehurst waterfront. That was reduced to a split level height of 12 metres increasing to 18 metres. There were also significant changes in the Carlton precinct. Some streets that had a proposed 21 metre height limit was reduced to the existing nine metres. There was also changes to properties on Connells Point Road, The Mall, Tavistock Road and The Esplanade at South Hurstville. The proposed height limit of 12 metres at those sites was reduced to nine metres. Those changes were met with cheers from from the crowd. The proposed changes to the Kogarah Town Centre were passed without change. What do you think about the decision to adopt the new Kogarah city plan?